Have you read my Ode to Trees that become Kleenex? Seriously, have you ever tried handkerchiefs? You probably think they are gross and icky, but this is actually far from the truth. I tried them out of curiosity a number of years ago (make that 6!) and I liked them so much that I've never gone back to disposal tissue. 1. You reduce demand for a product made from trees. 3. You save money by reusing instead of continuously buying tissues. 4. It's softer on your nose! 5. You can use pretty ones, like those above. 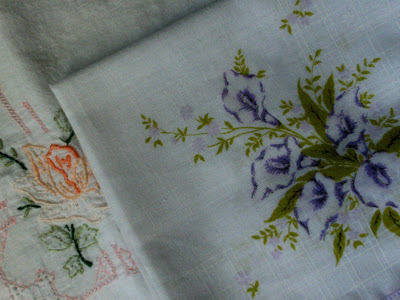 Linen ones are very absorbent, despite being so thin and delicate. 6. 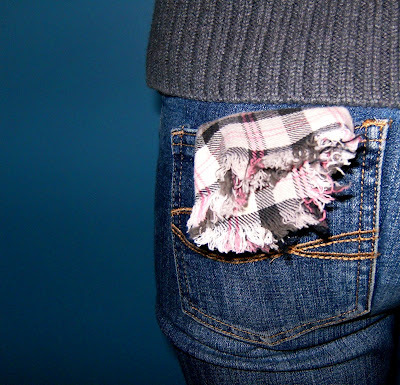 You can feel cool hanging one from your back pocket. 7. If its clean, it can double as a rag if you need to wipe up something. My first hankies were all pieces of plaid flannel pajamas. Works well but isn't very ladylike.